The detached style body is excellent for use with both Mayflies and Daddies. This Daddy variant is a good all-rounder as it's colour lends itself well to an adult damsel imitation. It must be abundantly evident that the fly should drop as lighty as possible on the water and that an awkward unmannerly 'splash' must inevitably mar the illusion. Body : Deer belly hair, dyed teal blue, ribbed with the tying silk. Wings : Hackle points in red game or furnace. 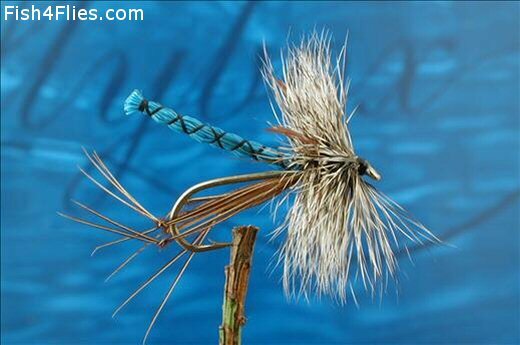 Currently there are no comments about the Detached Daddy Blue fly pattern from other fly fishermen yet.